Adirondack detailing and rustic log accents characterize the Treetop Townhomes, situated in mountain clusters with ski access from the Home Run Trail to the Base Area or Interstate trail towards the Sun Bowl lift. A private shuttle drops you by the trail or delivers you to the Base Lodge with on-call privileges. Wood burning fireplaces, multiple bedroom suites, spectacular views, outdoor hot tub and garage make this a most desirable community. I have a question about the property at 24A Winterberry Heights Stratton VT 05155 (#4727426). I would like to schedule a visit for the property at 24A Winterberry Heights Stratton VT 05155 (#4727426). Enjoy true trailside living and skiing at Stratton and never miss a powder day! This home has superb views and is being sold absolutely turn key for its new owners complete with unique antiques, custom finnishes and fine Ralph Lauren décor. It has been professionally decorated to the highest standard and must be seen to fully appreciate. 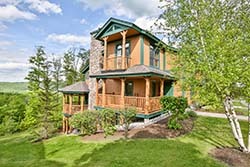 Situated in a superior location within the TreeTop community, it offers superb views and direct access to the ski trails. This home is a one of a kind in a community considered one of the very best at Stratton. I have a question about the property at 3C Woodfern Stratton VT 05155 (#4733767). I would like to schedule a visit for the property at 3C Woodfern Stratton VT 05155 (#4733767). I have a question about the property at 5C Beechwood Stratton VT 05155 (#4675282). I would like to schedule a visit for the property at 5C Beechwood Stratton VT 05155 (#4675282). I have a question about the property at 16B Winterberry Heights Stratton VT 05155 (#4672613). I would like to schedule a visit for the property at 16B Winterberry Heights Stratton VT 05155 (#4672613). I have a question about the property at 4A Viburnum Stratton VT 05155 (#4695696). I would like to schedule a visit for the property at 4A Viburnum Stratton VT 05155 (#4695696). I have a question about the property at 8b Dogwood Trail Stratton VT 05155 (#4699404). I would like to schedule a visit for the property at 8b Dogwood Trail Stratton VT 05155 (#4699404). Great new price for an extraordinary Treetop! Largest Square footage, Viking kitchen, custom baths and floor plan with extraordinary pre construction CUSTOM finishes.Don't miss the opportunity to purchase this unit, listed well below assessed value. Great price for this upscale unit with gourmet Viking kitchen with marble countertops. Exceptional tile and stone in each individually designed bath, oversized mudroom, wood floors and California closets. You will not find another Treetop with these finishes. The unit was designed with great attention to detail and unlike the original units.The unit boasts two masters en suite and also a lower level family room. With long range vistas, you'll enjoy the changing seasons, spectacular fall foliage and winter snow storms with unobstructed year round views from this beautiful multi level town home. Wood burning fireplace and cathedral ceiling in the great room, adirondack woo and log accents, deck and detached garage. Best of all you'll enjoy every resort amenity and private shuttle from your doorstep to the Home Run trail or Base Lodge. Ski back at the end of the day! Sports Center Bond eligible. I have a question about the property at 6 Cranberry Stratton VT 05155 (#4672911). I would like to schedule a visit for the property at 6 Cranberry Stratton VT 05155 (#4672911). Great Price for this 4 bedroom Treetop with trailside access.You'll ski out and back for lunch with ease! This Woodfern unit is ideally located next to the 91 and Bliss's Trail . Exceptional Adirondack style town home, you'll enjoy the long range year round views, and most importantly one of the best locations at the top of the Treetop community.Wonderful 4 bedroom/3 bath custom floor plan with loft converted to an additional bedroom. Cathedral ceilings and wood burning fireplace. Gourmet kitchen, tile and granite bathrooms, two masters en suite and lower level bunk room. Nicely appointed. Private Treetop shuttle also available and the unit is Stratton Sports Center eligible. You'll appreciate the convenience of skiing home at the end of the day and relaxing in your own private outdoor hot tub for apres ski. One car garage. Location & views, views, views! I have a question about the property at 11B Woodfern Run Stratton VT 05155 (#4671627). I would like to schedule a visit for the property at 11B Woodfern Run Stratton VT 05155 (#4671627). I have a question about the property at 12A Juniper Stratton VT 05155 (#4716101). I would like to schedule a visit for the property at 12A Juniper Stratton VT 05155 (#4716101). I have a question about the property at 8A Juniper Stratton VT 05155 (#4731357). I would like to schedule a visit for the property at 8A Juniper Stratton VT 05155 (#4731357). I have a question about the property at 3B Balsam Corner Stratton VT 05340 (#4657837). I would like to schedule a visit for the property at 3B Balsam Corner Stratton VT 05340 (#4657837).